SEPOY (AUS) (Chestnut 2008-Stud Aust. 2012, GB 2013). 10 wins-5 at 2, ATC Golden Slipper S., Gr.1. Sire of 143 rnrs, 59 wnrs, inc. SW Kilmah (Goodwood Prestige S., Gr.3), Baileys Showgirl, SP Dabyah, Garrard, Unforgetable Filly, Chipanda, Executive Force, Cortado, She's Positive, War Hero, Alizee, Zarpoya and of Khukri, Havildar, Jemadar, Vigilance, Ashwaq, Deningy, Indian Blessing, Soldier's Girl, Trooper's Gold, California Raider, etc. His oldest progeny are 3YOs. Trust Me (g. by Sepoy). Winner at 900m in 2016-17 in Aust. Silver Art (g. by Snitzel). Placed to 2016-17 in Aust. ELUSIVE TOUCH (Elusive Quality). 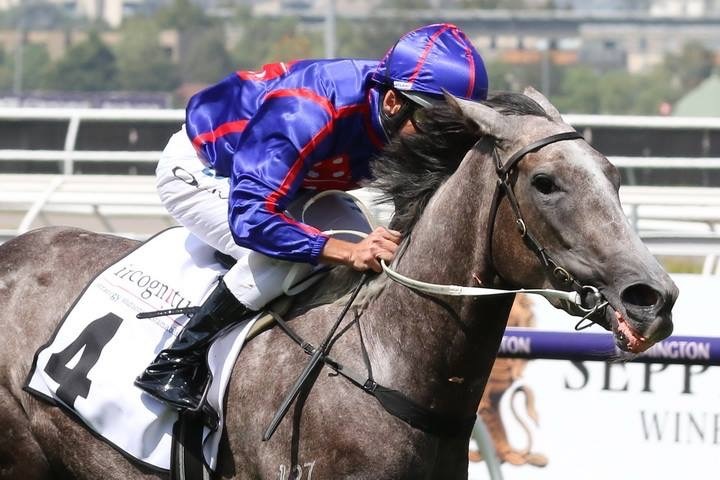 6 wins to 1200m, A$321,680, VRC Aurie's Star H., Gr.3, All Victorian Sprint Series Heat H., 2010 All Victorian Sprint Heat 4 H., STC Jacob's Creek Sparkling H., 2d VRC All Victorian Sprint Final H., MVRC Essendon Mazda H., 3d MVRC Pulse Pharmacy H., AJC McGrath Estate Agents H.
Rocknet. 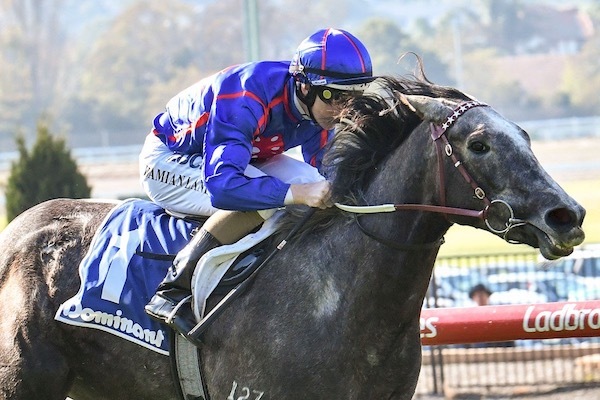 7 wins from 1400m to 2200m, A$203,520, to 2016-17, GCTC Smoke Alarm Solutions H.
Tolka Rock. 6 wins from 1200m to 1600m, A$111,645, MRC Events at Caulfield H., MVRC United Refrigeration H., 2d MRC Wheatear H., 3d MVRC Mix 101.1 H., Hollylodge Thoroughbreds H., Aquanas Foods H.
Ariaz (Charge Forward). Winner at 2, A$77,450, in 2015-16, MRC Toronado at Swettenham 2YO Fillies P., 2d SAJC Breeders' S., Gr.3, MRC Ladbrokes Challenge H., 3d MRC Comcater H.
SHELBOURNE LASS (Brocco). 4 wins. See above. Ngawhitu Star. 8 wins from 1200m to 1650m, Westland RC Miss Scenicland S., CJC Southern Region Apprentice School H. Producer. SKOOZI (PLEASE) (Prince of Praise). 9 wins-1 at 2-from 1000m to 1600m, £1,125, US$472,500, NZ$110,250, A$531,100, 33,120Dhs in NZ, Aust. and U.A.E, VATC TS Carlyon Cup, Gr.2, JJ Liston S., Gr.2, 2d VATC CF Orr S., Gr.1, Underwood S., Gr.1, WRC Thorndon Mile, Gr.1, ARC The Oaks Stud Trophy, Gr.2, Nad al Sheba Godolphin Mile S., Gr.2, 3d Queensland Derby, Gr.1. KIRI (Prized). 8 wins from 1600m to 2200m, NZ$191,960, ARC Cornwall H., L, BOP RC Kiwifruit Cup, L. Producer. JERAM NEW VILLAGE (Faltaat). 9 wins to 1400m, 1,042,780Rgt. in Malaysia, Penang TC Astro Wah Lai Toi Sprint Trophy, L, Dr Lim Ah Soo Memorial Trophy, L.
CONFLUENCE (Paris Opera). 2003 Malaysia Horse of the Year. 12 wins from 1200m to 2200m, 15,250, 3,931,621Rgt., S$137,250 in Malaysia and Singapore, Selangor Gold Cup, L, Penang TC Yang di Pertua Negeri Gold Cup, L.
VINAKA (Volksraad). Joint Champion 2YO Male in NZ in 2000-01. Champion 3YO Sprinter in NZ in 2001-02. Champion Older Male Sprinter in NZ in 2003-04. Head of The 2001-02 NZ 3YO Free H. Joint top colt on The 2000-2001 NZ 2YO Free H. 8 wins-3 at 2-to 1400m, NZ$475,900, S$10,575, ARC Railway H., Gr.1, WRC Telegraph H., Gr.1, Hawke's Bay Guineas, Gr.3, WRC Wakefield Challenge S., Gr.3, Matamata RC Slipper S., L, 2d Manawatu Sires' Produce S., Gr.1, Otaki Maori RC WFA S., Gr.1, ARC Eclipse S., Gr.3, Newmarket H., L, Waikato RC Star Way S., L, 3d ARC Railway H., Gr.1, Waikato Draught Sprint, Gr.1. LIM'S GRAND (Gold Brose). 4 wins at 1200m, S$525,506, 34,000Dhs, Singapore TC Paititi Gold Trophy, L-twice, 2d Singapore Derby, L.
VAALU (Volksraad). 10 wins to 1400m, NZ$199,465, Waikato RC Sprint H., L, 2d Avondale JC Concorde H., Gr.2-twice.